Kids growing up in the mountains where I live love to tie young trees’ trunks into knots. As you drive along the roads, you often see older trees with trunks twisted long ago by young hands. 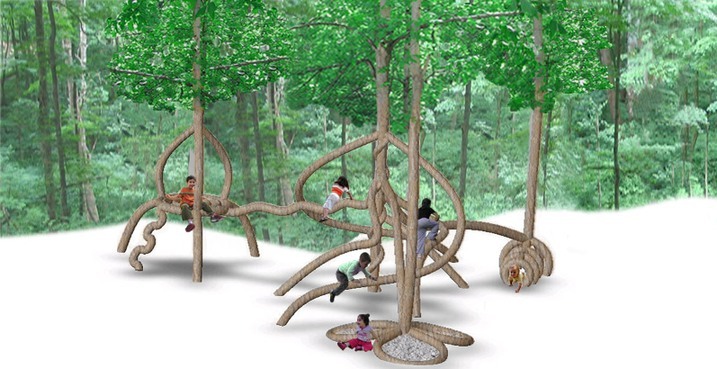 Plantware has taken this concept even further in designing a living playground for children by manipulating roots and trunks. KinderForest gives children real trees to play with, gives parents a natural alternative for their children and gives earth urban reforestation that is functional, enjoyable and green. Creating structures from living trees means that ~95% of the playground’s mass is taken from the air using local sunlight and rain. No gasoline-burning chainsaws, trucks, ships or waste. Such structures can live for 700 years and are self repairing, earthquake safe, oxygen producing and provide a habitat for wildlife coinciding with their purpose for humans. I don’t know how long it would take for such a playground to be developed, but as a parent, I would love to take my children to a living playground. Imagine the dramatic play that would develop as children explore the shaped trees. Perhaps I will experiment in my own yard in hopes my grandchildren will have a living playground, but isn’t nature already a living playground for young naturalists? I love this idea, but what’s with the fake photo? This is valuless. Gutter! I love this idea! Very eco chic! Nice idea but where I live the kids would just wreck it. Wow! Just came across this article, and I must say, I wish they had stuff like that when I was a kid! Living playgrounds would be so, so much better than big plastic junky ones that you see everywhere. Those are sooo 1989. Are dangerous parabens lurking in your beauty products?